We’re thrilled to be bringing you this guest post from Shani Thornton, a certified Child Life Specialist. Certified Child Life Specialists work with children and families in the hospital and in the community, providing psychosocial and emotional support. Through education, play, and creative arts, they bring a sense of normalcy to families and empower them with coping strategies to overcome challenges. “Congratulations on becoming a new parent or adding another little love bug to your growing family. The journey from pregnancy to holding your baby for the first time is a magical experience that makes a parent’s heart explode with love and hope. Soothing your baby with gentle strokes on their forehead, nose, and lips, smelling their sweet baby scent, covering them with kisses and cooing over every noise, moves or breath that they take is a pivotal moment in your lives. You are bonding with your baby; helping them to feel safe, loved and attached. 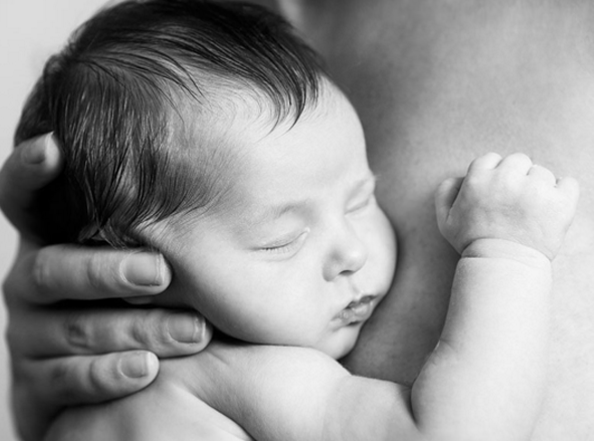 Research has shown that skin-to-skin contact provides a multitude of benefits for both the baby and the caregiver. Have you ever seen a parent walk down a busy city street with a baby held in a front carrier? With the over stimulation of loud noise, smells, and lights, the baby is calm and comfortable as they lay their head closely to their parent’s chest listening to their heartbeat and breath. They are comforted by their parent’s smell, touch and voice. This simple practice can be done in the NICU and at home to help boost baby’s growth and development. When you read a book to your baby you are helping to strengthen your emotional bond and also foster language development. Books can also be used as a transitional time to help babies adjust to a routine. Reading before naps or bedtime is a wonderful way to soothe your baby with your voice. Siblings can also be part of story time, choosing the books, snuggling up close and reading to the baby. For babies in the NICU, parents are still encouraged to read aloud. When you aren’t able to be at bedside you can record your voice and have the nursing staff play it in their isolette. Whether your baby is in the NICU or at home, there will be many checkups the first year of their life. Babies are often put through many painful medical procedures without a pharmacological treatment to help ease their discomfort. Child life specialists encourage parents to advocate for comfort holds to help soothe babies during medical exams and procedures. Studies have shown that holding your infant in a comfort hold versus having them held down in prone position is more effective in helping them to stay calm. If you are not able to hold your child, then advocate to be present during the procedure, so you can calm your baby with your voice and gentle touch. As your baby gets older, reading “It’s Time For Your Checkup: What to Expect When Going to a Doctor Visit” is a great resource to help prepare kids and parents for routine wellness exams. It is important to prepare siblings for the arrival of the baby. This is a drastic change in their life as they take on the role of a big brother or sister. Reading books, playing out family themes and even creating their own storybook for what to expect will help them process this new change in a healthy way. Siblings need to feel in control and connected, so sticking with their routines and spending one on one time with them is crucial. Siblings that are separated due to the NICU should be included on information about the hospitalization. Meeting with a child life specialist or social worker to explain what is occurring can help them feel safe and clear up misconceptions. Visitation is encouraged if the hospital’s policy allows it. Decorating the baby’s isolette with family photographs, art, and plush items that siblings pick out are also great ways for siblings to connect. Shani Thornton is a Certified Child Life Specialist and parent of two young boys. She provides in-home child life services from her private practice in Nassau County, New York and is an adjunct faculty member for the graduate Child Life Program at Bank Street College. She is also the author of a children’s book, It’s Time For Your Checkup What to Expect When Going to a Doctor Visit. To get more resources on parenting and child life, follow her blog or email her at childlifemommy@gmail.com. Stay connected on Twitter, Facebook, and Instagram.